I have received so many requests for a series of practices focusing on each of the different chakras. This is the first of those practices, and it focuses on the root chakra (located at the base of the spine). The root chakra has to do with a sense of safety, sense of security and grounding in the physical world. It is also all about our physical space, objects and material things. This first chakra is fittingly connected to the development stage of being a baby, and needing your parents to nurture and protect. Since this chakra resides at the base of the spine, all of the following asanas focus on the lower body (quads and hamstrings). You may want to have a set of blocks handy if you like to use them in your yin yoga practice. With each pose I will also provide an affirmation/mantra. Notice how they feel in your body. Don't force yourself to believe them but rather repeat each to yourself as you hold the pose and take note of how you feel. Some may be easy to hear, while others may make you tense up or feel uncomfortable. If so, this is a great opportunity to stop and journal, work on uncovering your resistance to the affirmation. These poses come from a full 1 hour practice on my YouTube channel - Root Chakra Yin Yoga. 1. Toe Squat - From kneeling, curl the toes under and let the hips sink back onto your heels. Let your hands rest down on the thighs, palms up. If this is too much sensation, feel free to bring the hands down in front of you, or relieve the pressure by lifting up off the heels intermittently. Relax the shoulders, close your eyes, and focus on your breath. Send your focus to the base of your spine and visualize a bright glowing red light there. Hold here for about 2 minutes. Affirmation: "I am safe." You may choose to say to yourself internally "I am" with every inhale, and "safe" as you exhale, as if breathing the mantra. 2. Ankle Stretch - Point toes back and let the hips sink down onto your heels. Bring your hands back behind you. This may already be more than enough, but if you want to take it further, curl and tuck the tailbone under and try to lift the knees and shins off of the mat. Find breath in this pose, again holding for about 2 minutes. Affirmation: "There is enough for everyone, including me." 3. Deer Pose - From a seat, align the right shin to top of the mat. Knee in line with the hip, and bending at 90 degrees angle and flexing the foot. Align the left knee to the hip out to the side, also bending the knee at a 90 degree angle so the foot kicks towards the back. This is a deep internal hip rotation, try to press and roll the left hip down. To kick this stretch up an extra notch, take the hands back behind you, still grounding the left hip down. Find your edge (as always in Yin we aren't seeking sensation but letting gravity do its thing), and breathe deeply. Soften into the pose, don't tense up. Affirmation: "Friends and family love and support me." 4. Half Butterfly Pose - Extend the left leg out to the side and draw the right heel in towards the groin. Hips and shoulders face forward. Rotate the chest over towards the left leg. You may want to have a block or two close by as you come into a forward fold. Make this fold passive and easy. Bend your left knee as much as is needed. Bringing a block or two to support you under the forehead or chest. 3 with left foot forward: "I attract abundance in all areas of my life." 4 with right leg extended: "My needs are valid." 5. 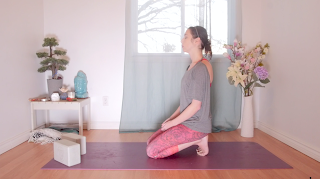 Dragon Pose - Kneeling on your mat, grab your blocks and set them up under the hands at the front. Step your right foot through in between the hands. Extend the left leg back, untucking the toes and staying on your knee in a low lunge. Align the front knee roughly over the front ankle. If you want to take a quad stretch, bend the left knee and catch hold of the foot with your right hand. Also optional here is to lower the hands directly to the mat (rather than the blocks). Let your shoulders melt down as you find stillness in the pose. Affirmation: "I can take care of myself." Carefully release the back foot and switch sides. Affirmation on the other side: "I give and receive equally." 6. Cat Pulling Its Tail - Make your way down onto your back. Make your way down onto your back. Pull your right knee in towards the belly, crossing it over to the left in a twist. Straighten the leg, holding onto the ankle, shin, foot, whatever is accessible. Draw the right shoulder down to the floor. Keeping the chest and collarbone facing up. To go deeper, bend your left knee and catch hold of the foot with your right hand. Affirmation: "I trust the process of life." Slowly release and roll back to laying neutrally, before switching sides. Affirmation on the other side: "I am grounded and stable." Don't forget to complete your practice by opening yourself up in a receptive manner in your final resting pose of savasana. And if you haven't already, grab your journal and write down what you experienced. Do you find it difficult to pace yourself in yin? Follow along with the video below. ☮ Website: http://www.yogawithkassandra.com ☮ Facebook: https://www.facebook.com/kryoga ☮ Instagram: https://www.instagram.com/yoga_with_k... ✔ GET A FREE AUDIOBOOK - http://bit.ly/audibleywk ❤ Your donations help me improve my channel and the quality of my videos, thank you! http://bit.ly/ywkdonate Yoga with Kassandra - Disclaimer Please consult with your physician before beginning any exercise program. By participating in this exercise or exercise program, you agree that you do so at your own risk, are voluntarily participating in these activities, assume all risk of injury to yourself, and agree to release and discharge Yoga with Kassandra from any and all claims or causes of action, known or unknown, arising out of Yoga with Kassandra’s negligence.